HORSES have always been the Froesch family's business and pleasure. At Team Froesch, we believe if we put our best efforts into our horses, the horse rewards us with thier best effort. Bert has done everything from breaking-in brumbies and was himself, regarded a fierce competitor. 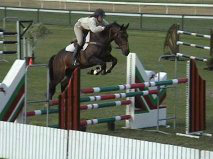 Melissa credits her successful show-jumping career - she has represented Australia several times overseas - to her parents' constant support and training. 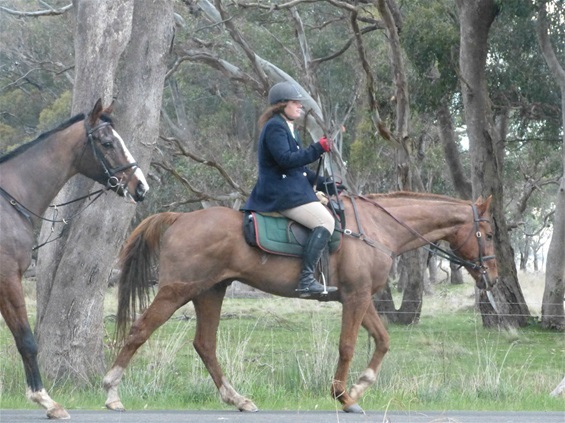 Melissa spends the winter months riding every Saturday and Wednesday to hounds as an honorary Whip, 'whipping in' for the Findon Harriers Hunt Club. Patrick celebrates 21 years in the saddle of a Hunter, and spends the winter months as Huntsman for the Findon Harriers Hunt Club Saturday's and Wednesday's and as Huntsman for the Melbourne Hunt on Sunday's. The horses Patrick and Melissa ride to hounds are understandably fit, agile and tough. Horses travel many km's during a hunt and need the agility to jump a 90cm panel 'inlaid' in a wire fence. Indeed - the horse that is worthy of hunting is very special - and at Team Froesch we are renowned for bringing out the best in our horses. Melissa looking very comfortable on her Hunter at the end of a Meet of the Findon Harriers Hunt Club.